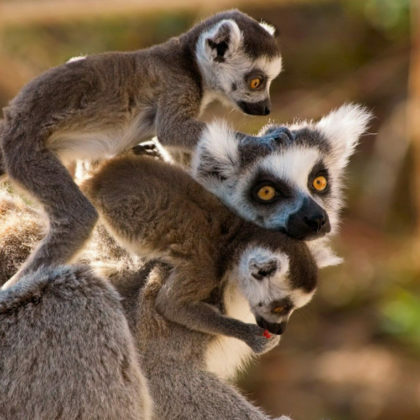 Lemurs are primates found only on the African island of Madagascar and some tiny neighbouring islands. Ring-tailed lemurs are unmistakable because of their long, vividly striped, black-and-white tail. Ring-tailed lemurs are endangered, largely because the sparse, dry forests they love are quickly vanishing. 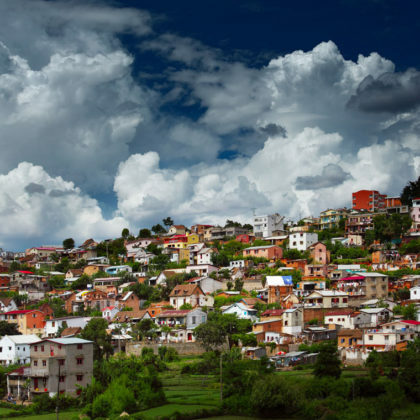 Madagascar’s capital city is Antananarivo which is often shortened by locals to Tana. It is the largest city on the island. The city is dominated by the old royal palaces on the two hills and central Lake Anosy. The old city on the hill is well-preserved and offers many sight-seeing opportunities. Tana also has interesting local markets to visit. The spectacular mineral forest of Tsingy de Bemaraha stands on the western coast of Madagascar. 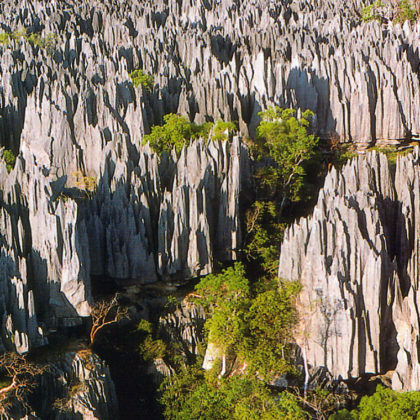 Tsingy is the Malagasy word for “walking on tiptoes” and the nearly impenetrable labyrinth of limestone needles justifies this name. The reserve’s canyons, gorges, undisturbed forests, lakes and mangrove swamps display an astonishing richness of fauna and flora which have not been completely recorded. Follow the call of the Indiri in the Andasibe-Mantadia National Park while following the walking trails. It has dense humid forests filled with fern species and beautiful orchids. 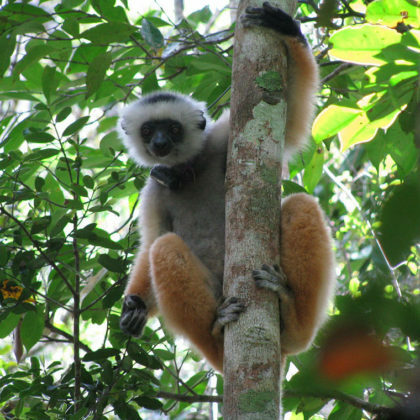 Besides the Indiri the park is home to 13 lemur including the diademed sifaka, red-mouse lemur and the black and white ruffed lemur. The forest is also home to leaf tailed geckos and many colourful butterflies. 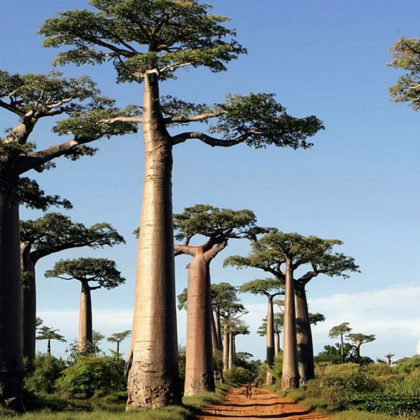 Madagascar is home to eight species of the unusual Baobab Trees and the most famous of them has to be Baobab Alley where these majestic trees lining the dirt road between Morondava and Belon’i Tsiribihina in the Menabe region of western Madagascar. Though remote to get too, they are one of the most visited attractions in the country. The Nosy Be Archipelago is situated off the north-west coast of Madagascar. It’s tropical climate and superb location makes it Madagascar’s beach-resort destination per excellence. Smell ylang ylang, coffee, cacao, vanilla on the air. 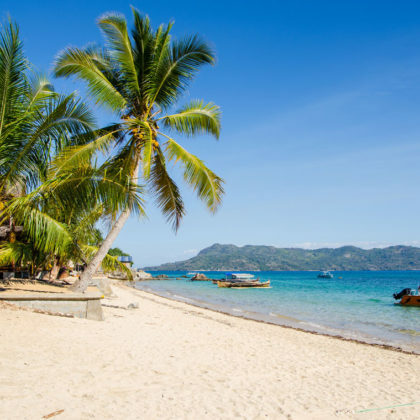 Get away from the crowds on white sandy beaches and explore blue-green seas and the amazing coral reefs, lush jungle in the Lobeke nature reserve and surrounding islands. 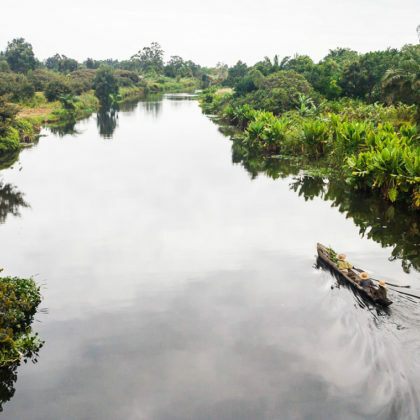 The Canal des Pangalanes, a 600-kilometerlong lagoon formed naturally by the washing of sand up on the island by the Indian Ocean currents and by the silting of rivers, has been used both as a means of transportation up and down the coast and as a fishing area. Cruising by boat on the calm waters of Pangalanes is a fascinating journey through time and history. 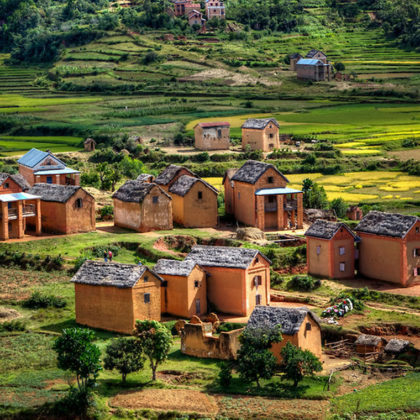 The landscape is made up of a plateau splattered with a succession of large rounded boulders, hills and several higher mountains, valleys and rivers, the biggest lakes of Madagascar, shimmering rice fields and hollow-like depressions. This landscape is more Asiatic than African in nature.